Meanwhile, Trump supporting Neo-Nazi Andrew Anglin is ducking a summons to appear in court as a defendant in a lawsuit in Montana. Despite having raised over $150,000 from his online supporters to pay for his defense against the harrasment suit brought by Missoula real estate agent Tanya Gersh, he has been unable to be located. The Southern Poverty Law Center, which is representing Gersh, has been looking for him high and low. Federal Law enforcement claimed he was out of the country when he and his supporters threatened detractors last year in the Bay Area. When he personally threatened local activists and reporters in Columbus, including visits to their places of work, nothing was done and he allegedly could not be located. He is thought to be hiding somewhere in Greg Anglin's vast Christian Counseling and real estate empire in Worthington. He has made court appearances in Columbus yet the SPLC was unable to find him. Greg Anglin is Andrew Anglin's father. Meanwhile, he is registered to vote on a barstool. His voter registration lists his address as 915 N. High Street. 913 North High Street is the address of a local bar called, interestingly enough, Local Bar. It seems Anglin should be receiving mail at the emergency exit. A visit by our investigators to the Short North karaoke palace during happy hour did not locate him. Anglin claims he spends 18 hours a day online and Local Bar has wifi. Perhaps he is there for their Hermit Crab races. They advertise them, but maybe that is not his thing. 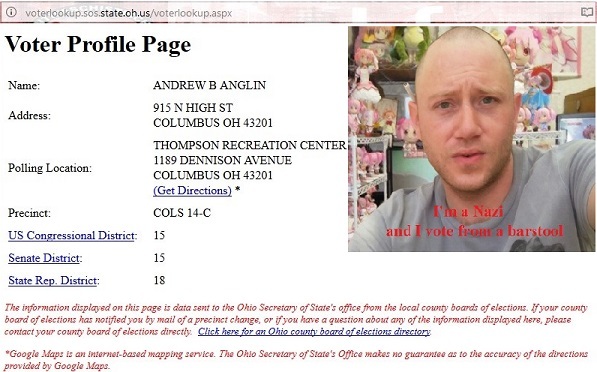 Anglin's voter registration is obviously fraudulent. This is a crime. Perhaps if law enforcement could find him at the supermarket, or his post office box in Worthington, he could be arrested for it. Perhaps then the SPLC could serve him. The Ohio secretary of state's office is probably too busy purging legitimate voters from the rolls, like they did to this author right before the last general election. Perhaps only self-proclaimed nazi Trump supporters are allowed to vote in John Husted's Ohio and Trump's America. The Columbus police are too busy gassing people of color at the Pride Parade and shooting unarmed African Americans in Linden to look into this particular crime. This is the very definition of White (supremacist) Privilege.